Comment: this issue of 12 tracks was initially released in 1997 whereas the British music scene was virtually shook by a wave of Britpop which started off sometime in the mid of the 90s and on the other side there was up the club dance scene of drum and bass, jungle, speed garage and house music of becoming more apparent on the mainstream ground. Indeed, these styles of dance music come to provide something refreshing for more demanding music lovers. On the other side, some of those artists whose music had had a remarkable influence on the aforementioned styles decided to stand off or set their steps otherwise to continue stubbornly their very own idiosyncratic path. Such true pioneers as Aphex Twin, Mike Paradinas-led projects, Dryft, Luke Vibert, Venetian Snares, Squarepusher would go underground again. 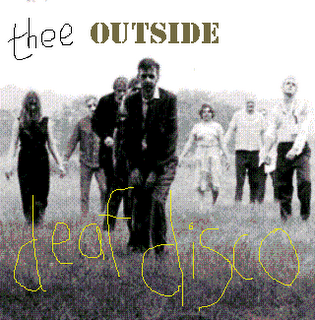 Thee Outside`s music in connection with artistic and aesthetic approach did have a similar, wide-ranging behaviour with regard to going beyond the boundaries of dnb/jungle music in a curious yet sapid way. Musically the artist used to loan from other adjacent styles yet exploiting deviant sonic effects in a great amount to the compound which appeared to be relatively uncommon then. All those details are accentuated and amplified in a truly poignant way. Although the nature of Deaf Disco is exquisitely experimental it might be as one of the most accessible notches in the discography of Year Zero. Let`s enjoy the dexterity of British people to generate poppy sounds for our pleasure. You should take time to concentrate and behave in the way it is repeated in a rhyme at Empty Mind - /empty your mind of all thoughts and distractions/you`ll lose yourself to become the music/.